Author: Lemony Snicket publisher:Harpercollins,1999,pg 162. The main character is Violet Baudelaire. She is fourteen and the oldest of the three children. Violet loves to invent and build strange devices. She always ties her hair up so nothing distracts her when she is thinking. She is right handed which we learned when she skips rocks across the water,one of her favorite pass times. Klaus Baudelaire is Violet's younger brother.He is twelve, the middle child and wears glasses. Klaus is very intelligent because he loves to read books. He can tell you all kinds of facts such as who killed Julius Caesar or the difference between an alligator and crocodile. Sunny Baudelaire is Violet's youngest sister.She is very small in size but has four very large teeth. She only knows a few words, one of which is "bite". Mr. Poe was a good friend of Violet's parents. The children had met him many times at there parents dinner parties. He was their banker and executor of their estate. Count Olaf is both a count and an actor. He is very tall, thin, and unshaven. Both he and his house are very dirty. However, he is geographically the closest relative to Violet and her siblings, and her parents had stated in their will they must be raised in the city. Justice Strauss is a judge on the high court. She lives next door to Count Olaf and fell in love with the children telling them they could use her library and help in her garden. As a judge though, she has to uphold the law. The book is about deceit and greed. 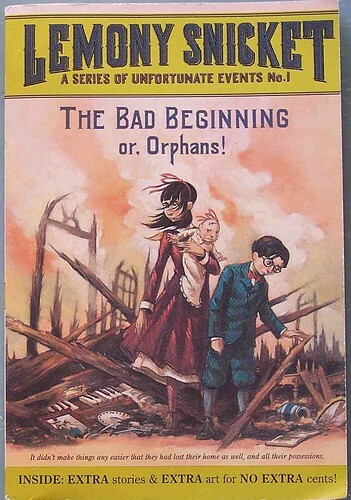 It starts out with the Baudelaire children losing their parents in a fire. The children are forced to live with a distant cousin, Count Olaf in a big, dirty, run-down house. They are made to cook and clean for the Count and are treated very badly. The sinister Count realizes that he can inherit the Baudelaire fortune if her marries Violet. So, he convinces Judge Strauss to be in his play called "The Marvelous Marriage". In fact, Judge Strauss will be actually marrying Count Olaf and Violet. Klaus figures out Count Olaf's plan before the play starts. Count Olaf finds out Klaus had read a law book on nuptials. So, Count Olaf puts Sunny in a cage and dangles her out the window of the high tower. The fear of Sunny being killed forces Violet and Klaus to go through with his plan to steal their fortune. As the play ends, Violet signs the official document with her left hand. As soon as she signs, Count Olaf tells the audience of .his evil plan. He had tricked everybody. He is going to get the fortune and there is nothing anybody can do about it. Violet then speaks up and tells everyone she signed the document with her left hand and not her right hand. This makes the document invalid. The law states that the document must be signed in her own hand which is her right hand not left. The children are safe for now, but Count Olaf escapes and is never caught. The conflict in the story is between Violet and Count Olaf. She was put into the horrible situation-marry the Count and loose their fortune or don't and loose Sunny. Count Olaf was smart enough to figure out how to get their fortune. Now, she had to figure out how to outsmart Count Olaf so she wouldn't have to marry him. Her brother and sister's lives depending on her. My favorite quote is: "I did not sign the document in my own hand, as the law states," Violet said. I like it because this is where you realize it was not "over" for the children and Count Olaf had not won. Violet had outsmarted the Count. I had totally forgotten about her being right-handed. And it does read in the book that she signed the document with her trembling left hand. This quotation made the whole story come together. I did not like the book. It was very dark and depressing as the author said it would be. The major criticism I have is that Count Olaf got away. I felt he should have been caught, jailed and tried for attempted murder. I also like books with a definite ending. This left you hanging and made you draw your own conclusions.